Brigid Kaye is a partner in the company and is the strategic business development officer. She hails from the great state of Texas. She has many fond memories and spins a pretty good story. Brigid has made Center City Philadelphia her home since 1994. 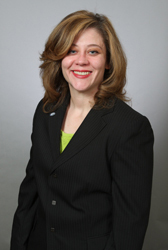 She is a Dale Carnegie Leadership graduate and a member of Center City Proprietors Association. Brigid attended the University of Texas where she majored in Microbiology with a minor in Organic Chemistry. Brigid always loved art and was pretty good at it. So, instead of becoming a scientist, she did what her mother told her to; she followed her heart and now makes creating art her livelihood. Brigid's expertise is a direct result of the passionate combination of graphic design talent, marketing skills and the latest technology. Brigid has nearly two decades of design experience with a broad range of clients. She is naturally energetic and enthusiastic about everything she does. Brigid played an integral part in the achievement of many honors and awards for Creative Characters. Among those are: American Printer magazine Feature Article April 2007, CPrint™ Salesperson of the Year 2004 and 2006, 2/20&15 Award for Superior Print Shop Management 2004, 2005 and 2006, and featured in Printing Impressions, Quick Printing and Create magazines. Brigid's clients say "she listens" to them and she "gets it". Working with Brigid is like working with an old friend. She's someone who routinely goes the extra mile to understand from your perspective. Brigid can be reached by email at brigid@creativecharacters.com.